Tories unlikely to stop Bill prohibiting paid plasma, but why are they even trying? 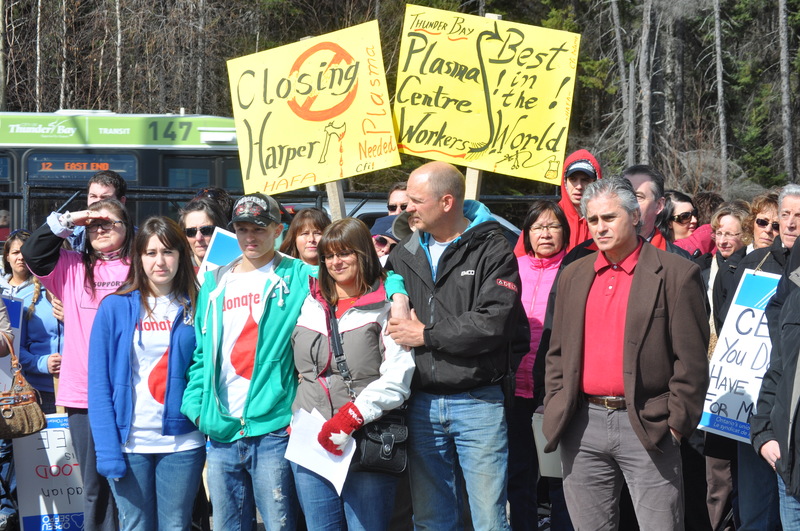 2012 protest in Thunder Bay against the closure of CBS’ plasma clinic. Health Canada claims — without any evidence — that self sustainability in blood products in impossible under a volunteer system, but we’ll never know if CBS continues to downsize its operations. The Ontario Tories recently have appeared to be distancing themselves from some of the more unpopular positions adopted by the party under Tim Hudak. Voting for second reading of an Act intended to close the door on paid collection of blood and blood components by the private sector, the Tories n one-the-less seem incapable of parking their ideology at the door as Bill 21 finds its way into committee. For two days the committee is conducting hearings into the legislation, seeing a parade of mostly private sector lobbyists lined up on one side and mostly family and survivors of Canada’s last tainted blood scandal on the other. Each presentation was limited to five minutes, followed by three minutes for each party to ask questions. In the case of the Tories, that three minutes was frequently used to make their own case that somehow we can’t do anything in this province without the involvement of private corporations. Yet the Tories appear to be siding with the private lobbyists as they toy with the idea of reversing one of Krever’s key recommendations – that paid collection of blood and blood components be banned except in rare circumstances. 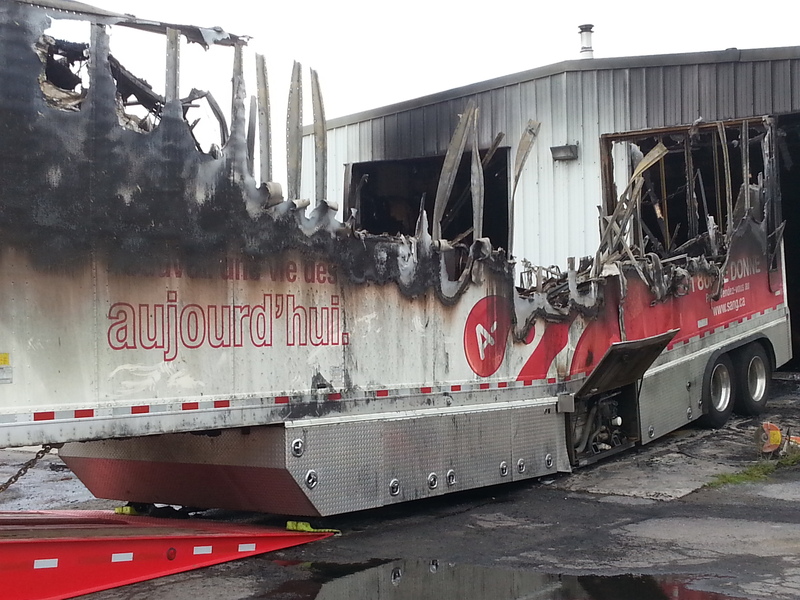 A fire destroyed this blood service mobile unit over the summer. Amid the lowest inventory levels in six years, CBS executives have decided not to replace it or the 7500 units of blood it collects annually. Canadian Blood Services is telling staff that national blood inventory levels are at their lowest since 2008. In a memo sent out September 30, Chief Supply Chain Officer Ian Mumford calls it “a serious performance gap,” leaving an already demoralized staff to wonder if they are being blamed for poor decisions made by the organization’s executives. CBS has been dismantling much of its infrastructure around volunteer collections in recent years, including the closures of entire facilities in Thunder Bay, Ontario and Saint John, New Brunswick in 2012. When an Ottawa-based bloodmobile caught fire this summer, CBS thought the volumes generated by it were insignificant and chose not to use the insurance to replace it. That blood mobile collected 7500 units a year. Another mobile truck that could generate similar volumes has been sitting idle in an Ottawa yard for most of the year. When appeals are issued, the call center staff in Sudbury are usually swamped. We’re told the phones ring off the hook and there are too few staff to answer all of these calls. That too has an impact on inventory — but that’s not all. It’s been more than two years since we said goodbye to the staff and donors of Canadian Blood Services’ Thunder Bay plasma collection centre. October 30 we will be returning there again as part of a unique cross-province campaign to keep our blood system safe. 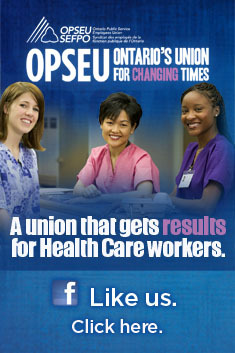 OPSEU is proud to sponsor the upcoming tour of Tainted by playwright Kat Lanteigne. A performed reading of the play will take place in seven Ontario cities October 18-30: Toronto, Ottawa, Hamilton, London, Windsor, Kingston, and Thunder Bay. All readings will be free to the public, but tickets should be reserved in advance. It will also be performed directly at Queen’s Park and in the center block of the Canadian Parliament to MPPs, MPs and their staff. Those attending the Ontario Health Coalition Action Assembly weekend will also be treated to a performance of the play on the evening of Saturday, October 18. Tour dates and locations are at the end of this post. In 2012 CBS said it had a surplus of plasma and no longer needed the Thunder Bay clinic which collected more than 10,000 units per year. We noted at the time that CBS coincidentally was increasing its imports of plasma from the United States by 10,000 units. That includes plasma from individuals who were paid for their donation, a practice that remains controversial. We were in for another surprise shortly after CBS shuttered its Thunder Bay clinic. The current debate over paid plasma donation has brought out a number of patient groups – including those funded by big-pharma – that are suggesting Canada has no choice but to pay for plasma donation owing to a world-wide shortage. Given Canadian Blood Services has been emphatic about sufficient supply on the world market, this is a rather curious claim. If you go to the home page of Alpha 1 Canada (which is funded by Kamada, Grifols, and GlaxoSmithKline, among others) there is no mention of their members having difficulty obtaining existing plasma–based products. So what changed, other than lobbying by Canadian Plasma Resources? In fact one of Alpha 1 Canada’s sponsors, Grifols, just opened a new fractionation plant in Spain that will double capacity in that country and assist in increasing their world-wide output from 9.6 million litres to 12 million litres of fractionated plasma by 2016. Grifols accounts for 20 per cent of the world market for plasma-based pharmaceuticals. Will Act banning paid blood and plasma collection die in committee? All the election talk raises the question of whether the opposition parties will pull the plug on the present minority government before passage of a bill that will ban paid plasma collection in the province. The Voluntary Blood Donations Act 2014 was referred to the legislature’s Standing Committee on Social Policy after it passed second reading April 14. The question is, will the parties drag the Act out in committee to an inevitable death, or will they push it back quickly to the legislature for third reading? The former, rather than the latter seem more likely at this point. Readers concerned about this issue may want to contact their MPP’s soon to encourage passage. The private for-profit Canadian Plasma Resources has already opened its doors in Toronto without licensing from either the Federal or Provincial governments. They made particular note of the World Health Organization’s caution that where paid blood donations are permitted, the number of voluntary donors decrease. This point should be underlined given the blood shortages Canada faced towards the end of last summer. It’s been almost two years since we stumbled upon a plan by a private for-profit company to open a series of clinics that would pay Canadian donors for plasma. The last voluntary dedicated plasma collection center operated by Canadian Blood Services (CBS) had just closed its doors in Thunder Bay a week earlier in April 2012. CBS has always maintained that there was never any connection between the two events. On the one hand CBS said they didn’t need the plasma generated from Thunder Bay, on the other a commercial company was being set up to exploit a world-wide demand for plasma to be manufactured primarily into intravenous immunoglobulin, used commonly to boost immunity during cancer treatments. Such private companies are not that unusual in the world, but in Canada sensitivities remain particularly raw given the so-called “tainted blood” scandal. About 30,000 Canadians suffered the consequences of imported paid plasma into this country from the United States in the 1990s. We met one of the survivors as we protested the closure in Thunder Bay. In 2013 Health Canada held a by-invitation-only roundtable on the issue of paid plasma donations following our efforts to raise concerns over the application by the private Canadian Plasma Resources (CPR) to go into competition with the public Canadian Blood Services. CPR had plans to immediately open two clinics in downtown Toronto to pay donors for plasma that would be turned into pharmaceutical product. A third in Hamilton was on its way. Their website says they still plan to do so in 2014. Former Ontario Premier Bob Rae has jumped into the debate, noting that both Hema-Quebec and Canadian Blood Services are now both opposed to licensing for CPR. Rae does not understand the delay by Heath Canada in saying no to the license application by CPR. “For whatever reason, it’s taking federal and provincial governments a long time to make up their minds. It shouldn’t,” writes Rae. “The integrity of the blood supply, and our continuing resolve to keep a strong volunteer base, should make the answer simple: no to “pay for blood or plasma”. Period. To read Rae’s full BLOG post, click here. For more on the ethics of this issue, click here.